What is our Diamond Mentorship Program? 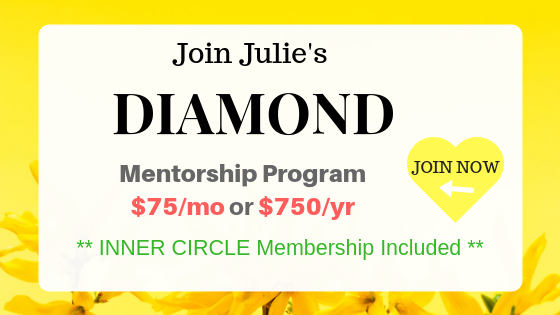 The Diamond Mentorship Program is an opportunity where I can interact with you personally in a private one-on-one setting at an incredibly discounted price off my standard rate. assistance in connecting with your own Spiritual Team + so much more! During the 30 minute call we can delve deeper into your personal and professional life and you can truly get the advice, guidance and direction directly from your own Spiritual Council (that I can tune into) and Archangel Metatron, the master teacher that I personally work with. Often times I can see things you cannot, thereby assisting you in making clear, decisive decisions and taking the action you desire to create a more successful, harmonious life. You will receive a link to be able to schedule these sessions at your leisure. Once your payment has been received you have 30 days to use your session before it expires. The Crystal Bed Healings are done weekly as a group offered Sundays (around) 7:00 – 7:50 pm CST which is an AWESOME way to close the week and open up for a fresh start on Monday! Also, to increase the power of the healing when you see the message come through that we’ve begun or ended a simple acknowledgment on your part with an emoji or a thank you adds an ADDED extra BOOST of healing for all. Click here to learn all about the incredible healing that is possible with the Crystal Bed from Brazil. Once a week I “OPEN THE LINES” and the first FIVE people who post a question or request an angel card will receive a free psychic answer for the week. Can I ask a question through email? Email questions are not included in the mentorship program, but 2 Email readings per month may be substituted for your 30 minute private session. What If I’m not interested in the Reading Raffle? You are always welcome to join our private FB group “Inner Circle private FACEBOOK Group” whether you ask a psychic question or not. We value your input and would love to have you share inspiring quotes or videos that you have found on the internet. Also included in this level is 5 libraries of spiritual knowledge outlined below. We offer a MASTERMIND course to help you increase ABUNDANCE in your life. There are four key areas of a person’s life that when aligned create a well-spring of unending abundance: wealth/prosperity, health/weight, love/romance, joy/happiness. When we are aligned and have abundance in these four areas of our life anything is possible. This is a 28 day course hosted on my blog and typically offered once or twice throughout the year. Diamond $75/mo or $750/yr. *Cancel anytime. No obligation.